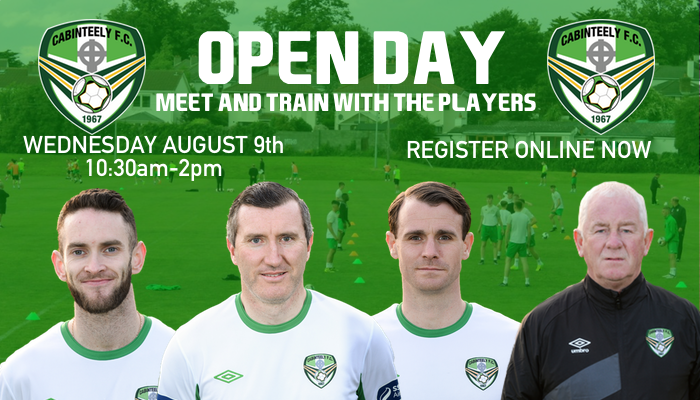 On Wednesday the 9th of August, Pat Devlin and our League of Ireland First Team are hosting an Open Day for Cabinteely FC players in Stradbrook from 10:30am-2pm. This event is exclusively for members of Cabinteely FC and is free of charge to attend. Boys and girls currently playing on our U8-U15 teams are invited to come down and meet the players, get photos / autographs and be coached by the likes of former Irish International Jason Byrne, top goalscorer Kieran ‘Marty’ Waters and club captain Daire Doyle to name a few of the League of Ireland squad that will be coaching on the day. If your child is interested, please register their attendance online below by Monday evening (August 7th) at 6pm. The below form must be filled out by a parent/guardian. We would ask all players to wear their Cabinteely gear on the day. We look forward to seeing you there!